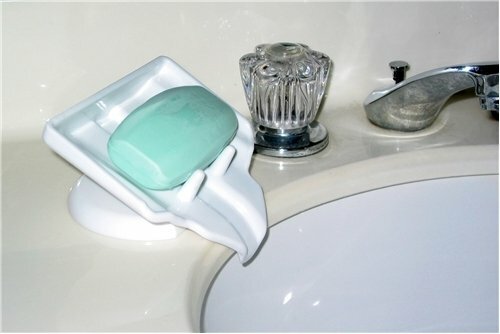 One of the most useful soap accessories you can have is a soap dish drainer. See how the soap holder is slanted and the hand soap held in place by prongs? This, as well as making the soap easy to grab, lets water run off, the soap stays dry, it dissolves less quickly and lasts longer. Much longer. It is a terrific soap saver. So a soap dish which makes your soap last longer, so saves money and if you have treated your self to expensive, perhaps handmade soap, lengthens your enjoyment of the treat. And offered to you in a pack of two. How many bathroom, shower and kitchen sink soap dishes do you need to upgrade? Soap dish drainer is wipe clean, and needs no fixing. Soap Dish Drainer text, images and video are copyright.